Light/Space/Design works with architects to create signature environments such as at National Life of Vermont. Renovations of existing working spaces such as this conference room receive special attention and lighting simulation to ensure proper lighting. New lighting accents the reception area at the Tuck School of Business. New office space in old homes receives special treatment by Light/Space/Design. Electrical installation services are a special service provided for these types of businesses when desired. Let Light/Space/Design show you the benefits of wireless lighting controls in flexible office spaces. 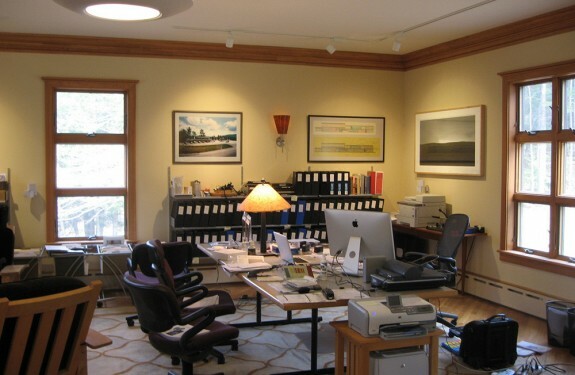 Ask us about lighting for home office spaces. It’s one of our specialties, and we now provide design and installation services. Lighting for comfort and flexibility is key in working environments. Since we are spending more hours at our workplace, we want our offices to feel like home. The good news is that with the increasing availability and affordability of dimming for efficient light sources, not only can every worker adjust lighting for their needs and preference, gains in energy efficiency can be outstanding when used in combination with automatic control systems. Energy efficiency is clearly not the best reason for good lighting design, although it is a good reason. Maintaining a skilled, highly adaptable and productive workforce requires well designed, highly adaptable and productive workspace. Quality lighting is a key element. Ambient light levels standards have been reduced in reaction to the use of computers in office and other work environments. Where office lighting is still commonly designed to 70+ footcandles, most work with computers is best done at 30 fc or less, with flexible task lighting when needed. Modern office lighting design has typically been aimed at providing even illumination throughout the space. Lighting research has shown that higher levels of contrast are well accepted by office workers, and may even be preferred- as long as the desk, walls, and work areas themselves are well illuminated. This goes along with a common desire for a more comfortable, homelike environment. Low contrast illumination is required where work locations and partitions are likely to change frequently, and task lighting is impractical. In these situations, high efficiency luminaires with programmable controls remain key to efficient, productive lighting. Advances in efficient ballast and fluorescent lamp technology have become widely utilized to reduce energy consumption. These fluorescent sources will remain viable for many years, although many installed systems can benefit from the addition of automated control systems. LED lighting has significant energy efficiency benefits, mainly when used in recessed interior applications. While dimming is more easily done, care in matching LED drivers to dimmers is important to eliminate noticeable flicker – something we thought we had eliminated with the advent of electronic ballasts. Use programmable lighting control panels to schedule lighting for the most efficient and flexible operation. With digital lighting controls, both wired and wireless, additional reductions in energy use can be achieved while offering occupants a chance to manage their own light levels.